Dr. Steven M. Balloch has proudly served the Hartford area for years, helping patients have beautiful, healthy smiles that last for years and years. This is achieved through advanced cosmetic and restorative dentistry treatments focused on smile aesthetics and total wellness. While cosmetic and restorative dentistry are keys for enhancing wellness, the bedrock of the practice is general dentistry and preventative care. At the heart of all this is the routine dental visit, which patients should never take for granted. Many people take for granted just how important and effective regular dental exams are, but they shouldn't. Meeting with your dentist every six months allows you to get the kind of professional treatment that cannot be provided at home. The technology and expertise provided by a dentist will help you have the healthiest smile possible. Dental x-rays are a very important part of the dental exam process. These x-rays will offer dentists a close look at the internal structures of the teeth, gums, jaw joint, and various bone structures of the mouth. This helps dentists pinpoint problems and determine ideal solutions for lasting dental wellness. These x-rays will wind up in your dental records to help improve overall treatment during your next visit. A professional dental cleaning is more thorough and targeted than the brushing and flossing you do at home. The dentist and hygienist will floss your teeth and use an electric brush to polish the hard-to-reach spots of your mouth. A scraper may also be used to get rid of some hardened plaque/tartar on your teeth. Once the cleaning has been completed, you dentist will then check your teeth and gums. When it comes to the teeth, your dentist will identify any problems, such as chips, cracks, and structural issues. For the gums, checks will be done for recession, discoloration, swelling, bleeding, and lesions. Sometimes patients will notice certain issues over the course of a few months not readily apparent at the dental visit, such as dry mouth, chronic/persistent bad breath, or issues with the jaw joint. During dental checkups, these issues can be brought up with the dentist so they can be treated or at least looked into in greater detail. 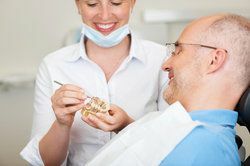 Open dialog with a dentist is a great way to get your smile to look its very best. Your dental visit will allow your dentist to discuss your future dental care needs in greater detail. If you need to undergo major dental treatments, such as orthodontic care or wisdom tooth extraction, these can be addressed in greater detail so you understand all risks and benefits that you may face. Planning ahead generally means a better treatment experience overall. For more information about your dental care options and how to make your smile its healthiest, be sure to contact our cosmetic and restorative dentistry center today. Dr. Balloch and the entire team look forward to your visit and helping you with your dental health needs.